Harvestmen appear to have a single body region. This year seems to be especially favorable for one of the strangest arthropods to wander the forest. Daddy-longlegs, also known as harvestmen, are particularly abundant. One urban legend tied to daddy-longlegs has it that the bite of this spider is among the deadliest of all creatures on the planet. Urban legends are curious things. Their origins are often obscure, but their reach can be far. The myth of the bite of the daddy-longlegs is patently wrong on two major accounts. First, the commonly encountered daddy-longlegs is not a spider at all. It belongs to a group of arachnids known as Opiliones whose closest kin includes scorpions and sun scorpions. There is a true spider called the daddy-longlegs spider, but there are no documented accounts of its bite harming a human. 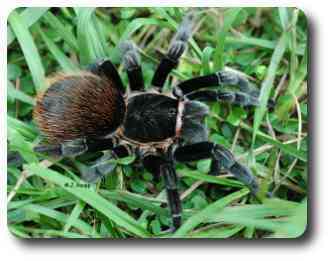 Spiders like this tarantula have two distinct body regions. Note the impressive hairy fangs. Harvestmen can be distinguished from true spiders by the shape of their body and their mode of feeding. The front body region of harvestmen broadly joins the second and creates the appearance of a single oval body with legs emanating around the perimeter. A pair of eyes generally sits atop a small mound on the front end of the harvestmen. The first body region of a spider bears legs, several eyes, and fangs, and it is distinctly separate from the second body region, the abdomen. Spiders have two fangs equipped with ducts that lead to venom glands. Spiders inject venom into their prey to subdue them, but when threatened, a few spiders such as black widows and recluse spiders will bite humans and their venom can cause serious complications. Spiders secrete enzyme-packed saliva that liquefies tissues of a victim enabling the spider to slurp-up the juicy remains. Harvestmen lack fangs. Their mouthparts consist of three movable parts that function more like the mouthparts of a crab shoveling small bits of food into the mouth. Most spiders capture living victims by actively hunting them, sitting and waiting for them to come into reach, or spinning webs of silk to snare their meals. Harvestmen are omnivores and wander about eating a variety of other small arthropods either dead or alive, vegetation, and fungi. On occasions that I have watched harvestmen dine, newly molted and virtually helpless gypsy moth caterpillars and periodical cicadas were on the menu. As you see in the accompanying video, a recently deceased stonefly also appears to be fine fare. Although they lack fangs and venom, harvestmen are not defenseless. One of their first tricks is to shed a leg if nabbed by a predator or curious human. The leg will continue to twitch and writhe for quite some time after it detaches. The motion is thought to distract would be predators from the daddy-longlegs as it makes its escape. Many species of harvestmen have a pair of stink glands that produce a smelly fluid known to be repellent to predators like ants. So what should you do if you encounter daddy-long legs? One English tale warns of bad luck if you deliberately harm harvestmen. Legend has it that harvestmen have a magical scythe used to help farmers harvest their crops. In their role as decomposers, daddy-long legs provide an important ecological service helping to recycle dead things. Enjoy these ancient and helpful arthropods that pose no threat to us. Bug of the Week thanks Mercedes Burns who provided the inspiration for this episode. The wonderful books “Secret Weapons” by Thomas Eisner, Maria Eisner, and Melody Siegler and “Harvestmen: the biology of Opiliones” by By Ricardo Pinto-da-Rocha, Glauco Machado, Gonzalo Giribet were used as resources. To learn more about harvestman, please visit the following web sites.